Each wind turbine costs more than £2 million and generates an estimated income of more than £500,000 per year.Any loss or downtime of these valuable assets makes the industry less viable and productive. Dr Guillermo Rein of Imperial’s department of mechanical engineering, said: ‘Fires are a problem for the industry, impacting on energy production, economic output and emitting toxic fumes. If wind turbines were planes they would all be grounded. OB: If wind turbines were planes they would all be grounded. According to the original article, one wind turbine catches fire in 1,000 years, not in 10,000 years as reported. Don’t waste time on that. Did you come up with that fantastic description of the windmill industry? TO BAD IT ISN’T MORE FOR THIS JOKE OF POWER GENERATION. This is still a low failure rate, surely? I did find some research on reliability of wind farms last year, but the PDF is now not downloadable (http://www.researchgate.net/publication/205337678_Reliability_of_Wind_Turbines/file/3deec517c0f7157a68.pdf﻿). Colin: If it’s a low failure rate, why isn’t the industry saying so, rather than hiding 9/10ths of it? Given that a number of the failures happen when brakes fail in strong winds, and the proximity of many turbines to dry summer forests, there’s no room for complacency here whatsoever. The windmill industry has no incentive to make honest reports. The fire hazard TB refers to is a real issue. Additionally, if windmills were so dependable, then grid managers would not rate the power output of windmills at small fractions of their rated capacity. I don’t doubt Colin’s sincerity. I doubt the sincerity of the data he has been given. That bit from Carl Sagan is so worth re-reading. And the Apollo 11 documentary was bittersweet. We really did achieve so much. And the takers have reduced us so far. tallbloke: I agree. Subsidised industries should make data such as this public. I expect most fires are averted due to the sensors picking up mechanical failures/temp rises before combustion. Questions to ask: what are the causes of the fires, gusts of wind=>mechanical failure? So- how long until the BBC demands that ‘Yachting Monthly’ not talk to skeptics? Won’t have any impact on Funders or Believers. After all, what’s a decimal point between friends? 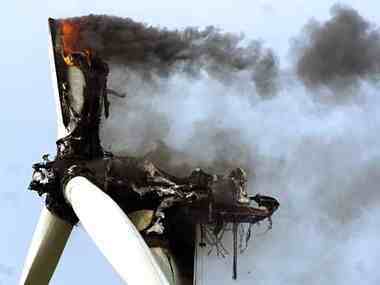 That’s £200,000,000,000 wasted on wind turbine AND more to come. This point is very important. In france they are erecting many turbines in forests. Normally, it is obligatoire to cut the trees down within a 500m radius and replant elsewhere. This requirement has been waved by the socialists. Our forests are very dry in summer. We are not allowed to light a fire at any time of year within 200m (Bar B Ques included) of a forest and a flame fire at all. The rest of the year, fires are forbidden in the months of june, july, august, september and restricted fire only in march, april, may. Turbines can ignite any time they like. >: If it’s a low failure rate, why isn’t the industry saying so, rather than hiding 9/10ths of it? Because [mod: snip] about everything comes so natural for the wind industry, they just can’t help themselves. .
Sara, you asked when will the BBC demand Yachting magazine stop talking to skeptics? The answer of course is when Grantham’s attack dog tells the BBC to do it. Don’t forget this is only Catching fire, there are gearbox failures, blade failures and structural failures on top of that. A bit O/T, given the interesting weather the UK has been experiencing and all the houses being set on fire by lightning I think it strange that there seems to be a total lack of damage to wind turbines by all this lightning. Are they that good at conducting lightning into their huge steel reinforced bases? ‘Vast majority’ – sounds like there are a lot of incidents? Only 117 worldwide last year (we now know of). I haven’t spotted the fire engine sheds at all rural windfarms. They must be in underground bunkers.